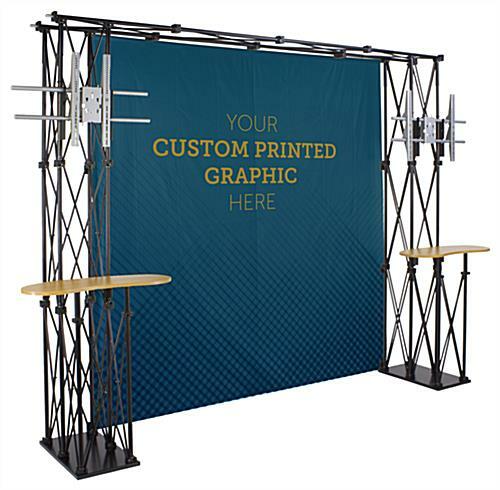 Trade show displays can hold 2 plasma or LCD TVs up to 60"
This truss trade show booth backdrop comes with an 8' x 8' custom 720 dpi print that will increase company or brand awareness. 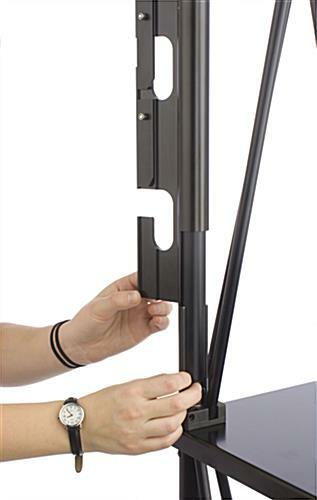 This graphic is attached to the display using (11) 2" x 2" hook and loop squares positioned around the frame. 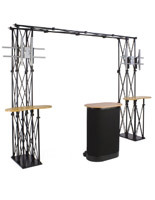 The booth backdrop has a collapsible truss design to easily assemble the unit with the provided instructions. 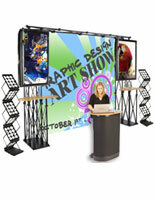 You can store this display in a compact area due to this design. 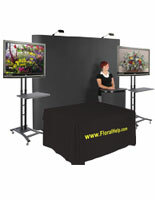 Included with purchase is an oval packing case to transport the display to and from events. 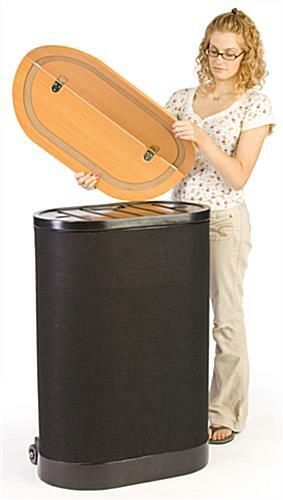 This case also acts as an additional counter by placing the provided countertop on top. 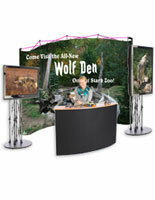 Our truss trade show booth backdrop also features two TV mounting brackets for displaying up to 60" wide flat screens. 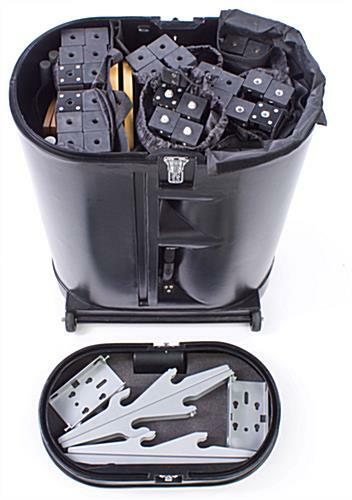 The maximum weight capacity for each bracket is 80 lbs. 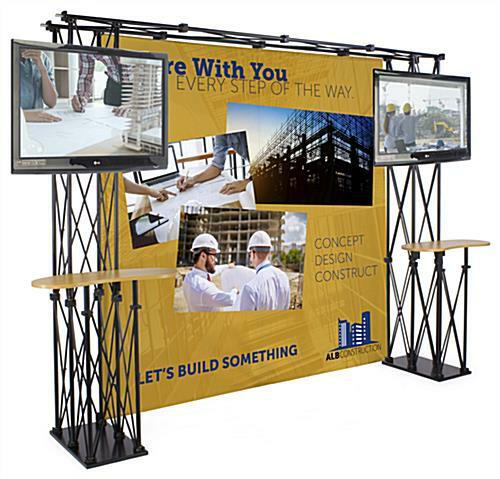 In addition, the booth backdrop includes (2) counters on each truss side for presenting or placing informational brochures and merchandise. These counters feature a kidney bean shape and are 31" wide. 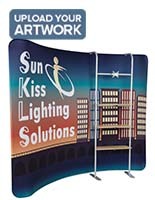 This bundled solution allows you to create an intriguing presentation that will help you garner the attention of passersby. 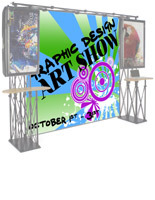 Buy a backdrop today to help draw customers in by combining traditional graphics with modern technology! Please Note: Depending on the size of your television & how you have each mounted, some of graphic may be obstructed when viewed straight on. 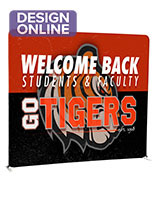 However, when looking at banner from different angles, you will be able to see the entire graphic. 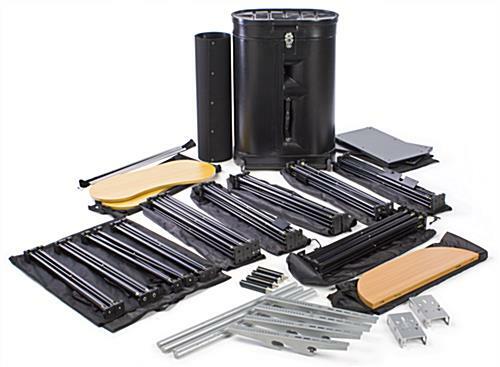 Purchased two of these booths at the end of 2015 and one of the cases is broken after only 3 round-trip shipments. Now have to buy another case. 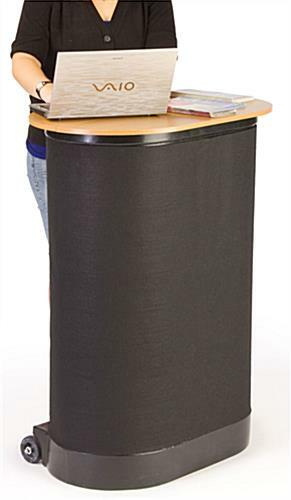 We had a Skyline booth prior and the cases were sturdy enough for 10yrs worth of shipments! So yeah, the booth is fine, hopefully we can get 7 more years of it, but cases are shameful. We are truly sorry to hear of your experience with the case, Vladimir. A customer care specialist will be reaching out to assist you with a return or finding a solution that works much better for you. We appreciate your feedback immensely and have also passed this insight along to our product team to review this product for quality assurance. Thank you again for letting us know. I was expecting a bit more from this product, but it gets the job done. I was given a wrong part and was able to correct it on my end. Otherwise it goes together somewhat easily. The velcro on the graphic doesn't match up perfectly with the velcro on the structure. The fabric that the graphic is printed on is really thin and transparent. I was trying to get an idea of how much of the graphic the monitors would block in order to design my graphic, but the company was unable to offer such dimensions. Edit: Bringing this down further in rating. 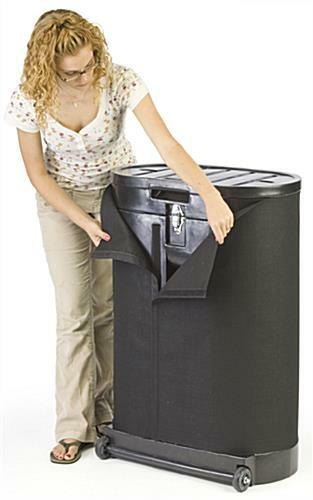 DO NOT SHIP IN THE CONTAINER THAT COMES WITH THIS PRODUCT. 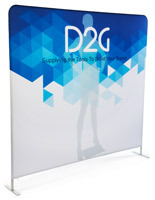 Displays2Go offers several cases that are supposed to be good for shipping trade show displays in them and I haven't heard anything good about any of them. If you must get your display here, get a case somewhere else. We're sorry you are not completely satisfied with your purchase. One of our Customer Care representatives will be reaching out to you shortly.